I’m currently reading The Whale and the Reactor by Langond Winner (1986). It was recommended to me by a colleague’s husband when discussing philosophy and IT. I’m into the 3rd chapter and it’s interesting, I would recommend it (at least, thus far). My interests in philosophy of IT stems from my early areas of focus including HCI/UX, social informatics, and digital humanities. While I’m not performing research in these areas, the readings still stay with me and I find myself trying to utilize terminology and methodologies from articles I read some time ago as I examine social media metrics (altmetrics), scholarly communication, and the academic reward system. During my Ph.D. years, I had the great opportunity to take a course at Indiana University Bloomington where myself and another doctoral student performed close readings of Martin Heidegger, Gilles Deleuze and Félix Guattari, and other prominent scholars discussing philosophy and technology under the supervision of Dr. Ron Day and Dr. Hamid Ekbia. It was a great time and I learned a lot about myself and the way I approach philosophy of IT. While I haven’t had the opportunity to pursue this interest of philosophy of IT, I have continued to shuffle the ideas around in my head and apply what I learned from the course and readings since this time to the way in which I think about scholarly communication, altmetrics, and the academic reward system. A Thousand Plateaus: chapters 1, 2, 3 (difficult),4, 10, 11, and conclusion. Watson, Sean. “The Neurobiology of Sorcery: Deleuze and Guattari’s Brain.” Body and Society, 4(23) (1998). Social media metrics (or altmetrics) is a relatively new area of study examining the distribution of scholarly articles within primarily social media contexts (which I’ve discussed here before). Of interest are both metrics relating to how often an article is shared in these environments and who/why/how the agents using the online platforms disseminate and consume this information. We, as social media metrics scholars, first used traditional bibliometrics measures to examine counts of social media acts and tried to determine if these counts correlated to an increase in citations of said articles. More recently, social media metrics scholars have begun to utilize theories and methods from other disciplines, including psychology, sociology, and linguistics, to examine these acts. I was very excited to be part of a book chapter (https://arxiv.org/abs/1502.05701) that discussed applying theories from other domains to the study of altmetrics. 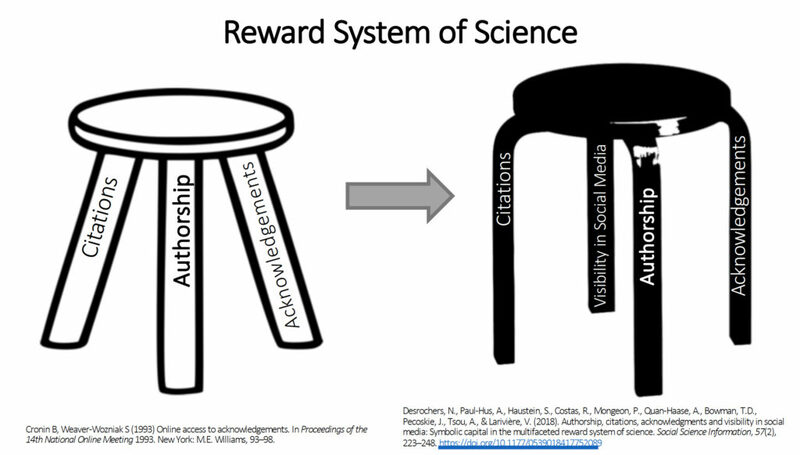 When examining the larger picture of the academic reward system, social media metrics could be considered a fourth leg of the stool. We have traditionally considered authorship, citations, and acknowledgements as part of the academic reward system. Yet, the ability to track social media acts relating to scholarly documents has introduced a new means of capturing the consumption and dissemination of these documents. While we do not claim that these acts equate to authorship, citations, or acknowledgments, these activities do represent some form of engagement with scholarly work. This change in a reward system after many years of relative consistency has brought about much discussion. 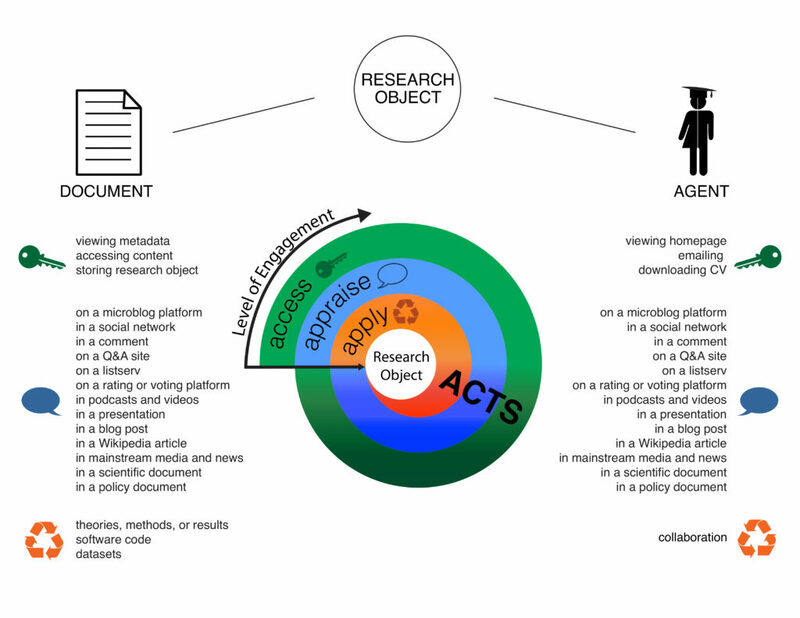 Part of the driving force behind adding social media metrics to the academic reward system is the notion of “societal impact.” These days, many funding agencies, universities, government entities, and (some) tenure committees are asking scholars to provide some evidence of how their research has had impact outside of academia. One way in which scholars can provide evidence of societal impact is to utilize altmetric-related counts. But, this notion of societal impact is highly contested and there are many different definitions of “societal impact” available. What I’m now thinking about and trying to consider is a way to discuss these changes in scholarly communication and the academic rewards system utilizing what authors have discussed in the philosophy of IT literature. 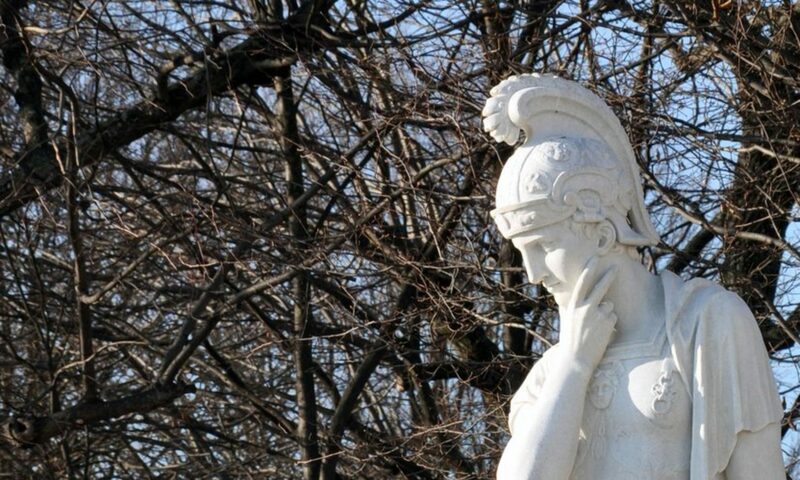 I believe that useful insights and vocabulary from the philosophy of IT literature can allow us to think about the academic reward system from a new perspective and critically discuss the impact social media and technology has had on the actors and acts performed within the academic system. Going back to The Whale and the Reactor book, Winner seems to focus (so far) on technology and power, which I have a feeling will provide useful insight into how I think about social media metrics (altmetrics) and the academic reward system. It brings to mind Latour’s Actor Network Theory and the agency of technology in a system.